This set includes two Christmas trees, two candy canes, two reindeer designs, an ornament, sleigh, Santa, wreath, stocking, and present cookie. Makes the perfect (and beautiful!) addition for your holiday celebrations and Christmas table to share with family and friends. If you're getting these for your kids class celebration and would rather have all of one design, we can do that too! Cookies are baked fresh for each order, heat sealed in individual bags, and packed safely in a bakery box. Cookies can be tied with a matching ribbon for an additional $3/dozen! includes Olaf, three snowflakes, Elsa's dress, and a sparkly mitten. Packaged in a kraft gift box with Christmas ribbon. includes Snoopy's decorated dog house, Snoopy's face, Lucy's face, Linus' shirt, Charlie Brown's shirt, Charlie's tree, and Sally's shirt. Packaged in a kraft gift box with Christmas ribbon. includes Christmas tree, candy cane, reindeer, sleigh, Santa, and a personalized ornament. This makes a wonderful gift for your kids teachers, Sunday school teachers, or anyone you'd like to give a little something special to this holiday season. Packaged in a kraft gift box with Christmas ribbon. Choice of square cookie with Santa or Christmas house shaped cookie. These make the perfect Christmas activity for the kiddos! Each cookie comes with a paint palette made out of food coloring and a paint brush. Just dip the wet paint brush in your color of choice and paint away. Create a beautiful work of art and then eat it! These are a thoughtful (and yummy!) addition to your teacher Christmas gifts! Please let us know the name you'd like to be included on your ornament and we'll package it in a clear treat bag with holiday ribbon. 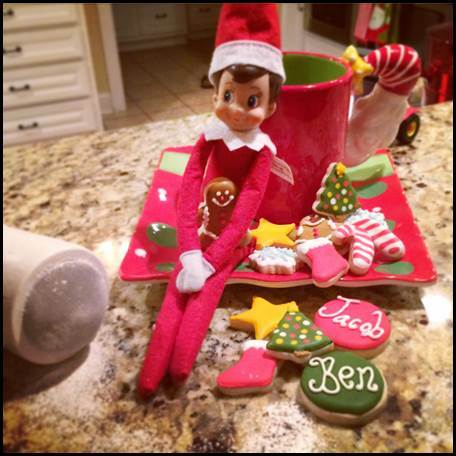 Elf on the Shelf loves to bake and decorate cookies! This cute set includes 14 mini cookies for your family's elf to bring your kiddos all the way from the North Pole! Shapes included are two candy canes, two gingerbread men, two Christmas trees, two snowflakes, two stars, two stockings, and two cookies personalized with your elf and child's name. Learn more about these on our provisions page. These make a unique personalized gift for the bakers in your life! Gift Certificates for Cookie Classes or Treats!